David Powers King: Wilder Mage Release, Some Very, Very Good News, A Huge New Members Shout-Out, and A Few Updates! Wilder Mage Release, Some Very, Very Good News, A Huge New Members Shout-Out, and A Few Updates! Welcome to September, crew - and a happy Labor Day to you! It gives me great pleasure to share the release of C.D. 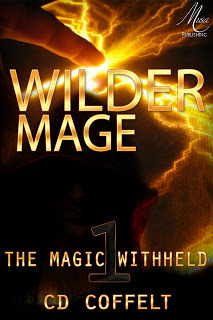 Coffelt's (aka, The Huntress's) debut fantasy novel, Wilder Mage - check it out! Justus Aubre is a wilder. A mage unbound to the Imperium, and therefore a dangerous wild card in their eyes. The Imperium wants him, wants his power, but Justus has hidden for many years and now has some semblance of a normal life. All that’s about to change when Sable Rounds walks through the door of his antique shop, looking for work. Justus instantly knows what Sable is, he just doesn’t know the danger he’s in. Alone, also on the run from the Imperium, Sable longs for a normal life. For somewhere to belong. She finds this when Justus hires her, but she knows it’s temporary and fragile, an illusion. Though she hates to think about it, she knows that one day she will have to move on. The Imperium is always behind her, waiting. When they finally find Sable, they find Justus. And all hell’s about to break loose. It's so cool to see your first book out, C.D.! I knew it would happen and I'm glad you never gave up on the writing scene. Good luck! Now for some news. I have plenty of people to thank for what I'm about to say, but big props must go out to Natalie Collins for her help after the Woven situation hit the news. Thanks to her help, all of your help, and after carefully considering offers of representation, I'm happy to report that our book has a champion; we have an agent! May I introduce the amazing Meredith Bernstein from the Meredith Bernstein Literary Agency Inc! She took it upon herself to drop what she was doing, check out our story, and fall in love with the world that we've created, and that's exactly what we were looking for! Team Woven just got bigger! We'll find a new home for our novel soon. I'll be sure to keep you updated on any developments. Without your help, this wouldn't have been possible. Thank you! It's been a while since I gave a much-deserved Shout-Out to our newest members of the Cosmic Crew, and here they are! Do me a favor and pay their sites a visit. It would sure make my day! Updates: I'm up to date on the reading and editing for the Christmas Anthology I've been working on, and I've got to tell you, it's going to be a sweet collection of Yule Tide tales! Our team captain should be announcing the details in the coming month or so. Now I'm back to reading and writing, and September will be dedicated to finishing The Undead Road - for real this time! 20K words to go. Let's do it! Be sure to click back for new posts, including the 2nd anniversary of Alex J. Cavanaugh's Insecure Writers Support Group! See you then! Also, if any of you are planning on hitting Salt Lake Comic Con this week, I'll be there Friday and Saturday. Good luck finding me, though - some 25K tickets were sold. Sounds like it's gonna be crowded! Doesn't C.D. 's book sound cool? What's your plans for September? Anyone know how to remove the foundation of a fence post? Wonderful news! Best of luck! Fingers are all crossed! Woo-hoo! Best news ever. I'm so thrilled for the both of you on signing with an agent! Congratulations on the agent!! That is very cool. Big cheers for Carol and her book. And an anthology - you have been busy. Ready to rock the IWSG on Wednesday! Meredith is one of the Queens of the literary world, an uber agent. Congrats! I'm a little awed. And thank you thank you times three for the shout out. This business isn't as easy as people would believe. Lots of hard work, especially after writing the manuscript! Can't wait for IWSG. Got my post scheduled even! I am so thrilled Woven has a great advocate! Hi David .. I'm so pleased that Woven seems to be coming together and publication is on its way. Gosh you have been busy ... then the weekend conference .. sounds fun. Congratulations! I'm very happy you found someone better who loves your book! I wish you all the best with Woven! Wonderful news about Woven, I'm so pleased for you guys. Can't wait to hear more news on it. Wilder Mage sounds great, I'll be checking that one out. Congrats on your agent news. That's so awesome! Congratulations on the agent news. That's wonderful for you! I love the cover and trailer this sounds like something I'd like to read. Also great news about the agent, wishing you guys the best. Hooray for finding an agent. Yay, yay, yay and congrats! Here's hoping good things for you and your book. David! Congrats!!! I'm so thrilled for you guys. Congrats David and I love Carol's book trailer. Congrats to CD and to you on the developments with Woven. Well done, guys. Happy to hear you got an agent!! I'm sure Woven will find home really fast. Awesome news, David! Good luck with the Christmas Anthology. Sounds cool! I know Huntress! Her book sounds great. Congrats on the Woven news, too! I am completely unsurprised and I just know that this is the first in a series of good news for you guys and your book. So excited to see what comes next for you!!! And I'm really looking forward to the Christmas anthology! Wow.. congrat's on representation. Meredith Bernstein is a heavy hitter. Talk about a blessing in disguise. Congrats DPK. Looks like a pretty good agent, but their website is kind of lame looking. Your website is cooler than theirs. Congratulations on getting representation! I know WOVEN is going to go on to better things. I'm not going to say that being cancelled by the Utah publisher was the best thing that ever happened to you -- because being discriminated against and verbally insulted is NEVER A GOOD THING, EVER. However this was a good door to CLOSE, and there will be many, many betters doors opening for you now. So glad to hear that!! Congrats!! Yay David and Michael! So happy for you guys! Congrats on your great news, and so glad your book has a champion. Wonderful news!! So glad you found an agent and I wish you and Michael all the best! I'm sure it will only be a matter of time before Woven has a fantastic new home. Awesome news on Woven! Glad the team is still going strong and growing.